It is indeed Really Random Thursday, but right off the bat let me say that I didn't figure out the Mr. Linky party thing. Hopefully by next week we will be up and running. So start looking around for all those really random things happening in your life so you can link up here. And thanks to the ever-fabulous Terri for designing the cool Really Random Thursday button. Thanks, Terri! So...Mark and I were in Minnesota for a little over a week. First of all, let me be perfectly clear on this. I LOVE the state of Minnesota. It is a beautiful state. I am married to a man who has lived in California nearly twice as long as he ever lived in Minnesota. But his Minnesota roots are strong and deep. We did a lot of driving. First arriving in the Twin Cities, over to the St. Cloud area, up north to where my cousin, Cathy, and her husband, Terry (also a Minnesota guy with deep roots), are building a fabulous log cabin, then down to southern Minnesota and back to the Cities. Whew. Along the way, we encountered various interesting, yet random, things. You can ask Terri and Amanda Jean. When we went shopping before heading off to retreat, I nearly did a little happy dance because I had entered the "land of Old Dutch." If you have never had an Old Dutch potato chip, you haven't had the best potato chips ever. Seen at a Chinese restaurant where we ate dinner the first night of the retreat. Now this is mainly amusing to me because of the thought of ketchup on fried rice. Mark has always told me that there are only three spices in Minnesota: salt, pepper and ketchup. Enough said. Sunday buffet. It is hard to eat low-carb here. Sunday night supper with Terry in Huntersville, which is so small it didn't even register on our GPS. But how many places can you eat where there are skunk pelts on the wall? BIG cheeseburger. Which is just like the name states: cheese and burger. If you want lettuce and tomato, you need to order a "California burger." Hah! We always try to eat at the Bergen Bar in Bergen, population 16. Awesome food. Because the place is really small and there is nowhere to wait, you give them your cell phone number and they will call you when your table is ready. Homemade fried chicken, mashed potatoes and gravy when we stayed with our friends, Roger and Clarine. Yum. PJs is the place to eat if you want something like gizzards, or decide you want to make healthy cauliflower a little less healthy by deep frying it and serving it with Ranch dressing. And really, Burger King? You are painting over a beautiful brick building? Who in the corporate office thought that was a good idea?? Cathy and Terry have electricity but no running water in their cabin. Yet. However...they have an awesome outdoor shower. Unfortunately (for me), the mosquitos are quite in love with this shower as well. Nice outhouse, too. I'm not even kidding. I am not a camp out in the woods kind of person, but this really was quite nice. I went to some quilt shops in southern Minnesota. Which can change in the matter of minutes from sun to raining so hard we had to slow down because the windshield wipers couldn't keep up. And to slow things down while driving, this guy pulled right out in front of us at the same time we were ready to make a left turn, and then just sat there until his light turned green. And finally, interesting things to read along the way. Gruber's Quilt Shop is at this intersection. A towel in our friend's bathroom. Can't argue with this one! Loved the decal on Doris's car! And finally this one, spotted on the way to the airport. Which was the whole reason we ended up in Minnesota at this particular time--so I could sew! This post is going in my "have-to-see-or-do-in-USA-map" Looks great. "If it ain't Dutch, it ain't much"
Looks you had a great trip! I guess you don't just have to be in Minnesota to encounter bad drivers! And they sure like fried food there too, don't they!?LOL! I just subscribed to your blog yesterday and was surprised to see today that you went to eat in Bergen. My grandparents live in southern MN and they always rave about that place. Next time I visit I will request they take me there! It was fun to see all those things I'd only heard about before... especially that shower. :) Several things made me chuckle, too. Ahh, Minnesota... gotta love it, right? Love seeing all your adventures across Minnesota! And what a great place to collect so many random things to share. I've always wanted an outdoor shower, but it had to be in a place where mosquitos don't live. Our homeymoon was spent up near Ely by the Boundary Waters in a cabin like the your friends' cabin... Very fun!! Thanks for sharing!! As I sit in the Eastern Iowa Airport awaiting my flight back to CA, I can so relate to this post. Loved it! Oh my goodness. Those poor Minnasotans putting ketchup on their fried rice. I don't think I could live there. What whould I do without good Chinese? I loved looking through your pictures. What an adventure! Now... I love ketchup and consider it a food group but I've never thought about putting it on fried rice! Old Dutch Ruffles are the BEST.CHIPS.EVER! Gotta have them for Top the Tater, which of course we can't get either here. Two of my favorite things to eat when I go visit family! I love Really Random Thursdays! 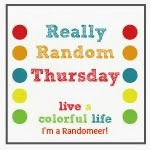 I love your Random Thursdays, especially this week's...it includes two of my favorite things...eating and visiting quilt shops ;-) Hope I can link up next week! I am not even sure I know which bits are gizzards, but I don't think I'd like them! I feel like I've been there now, Cindy! I was wondering if those skunk pelts were the leftovers from a good meal at the place where you can get the gizzards and fried cauliflower! 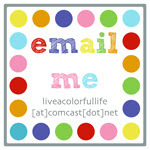 I'm so happy that you are doing a linky party for your Random Thursdays....I'd love to join you! I LOVE LOVE the serial quilter and sew plate! It looks like you had a fabulous trip. And ketchup on fried rice?! I just wanted to let you know that I chose you for The Versatile Blogger award. Check it out if you are interested. You can get Old Dutch in Minnesota? Get out!! I didn't think we ever let those babies south of the border. I figured they were a Great Canadian Delicacy like Hawkins Cheezies and Coffee Crisp bars... By the way, they also make ketchup-flavoured chips, another Canadian thing that is highly underrated. I could hardly get past all that food!! Just amazing!! I do love crisps, although I have a thing for salt and vinegar, marmite and the wonderful worcester sauce flavour! That shop that was a bowling alley is so brilliant. I totally agree about the wall too, so sad. I'll say it again. I love your random posts. I will try to keep up when you get started!